General Motors, the giant in the male-dominated auto industry, just named it’s first female CEO, who also happens to be an engineer. 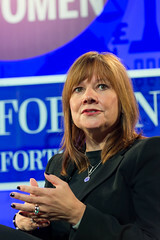 Mary Barra is currently the executive vice president of global product development has been with the automaker for 33 years. She has an electrical engineering degree from Kettering University and an MBA from Stanford and has held a variety of roles in engineering and assembly. Ms. Barra is taking on the top role as current CEO, Dan Akerson, leaves the companies to spend time with his wife who is suffering from advanced stage cancer. Ms. Barra started at GM at the age of 18 to help pay tuition for her electrical engineering degree. She has told Forbes that “being a car gal rather than a car guy has never stood in her way. It’s about no-kidding results.” Her focus in her current position has been to build at least 500,000 vehicles with some sort of electrification (including hybrids). It’s good to see an engineer (who happens to be female) in the top spot of a company that’s in an industry that’s historically been very male-dominated.